Reporting the number of sections and rows in the table. Providing cells for each row of the table. Providing titles for section headers and footers. Configuring the table's index, if any. Responding to user- or table-initiated updates that require changes to the underlying data. Only two methods of this protocol are required, and they are shown in the following example code. // Return the number of rows for the table. // Provide a cell object for each row. // Fetch a cell of the appropriate type. // Configure the cell’s contents. Use other methods of this protocol to enable specific features for your table. 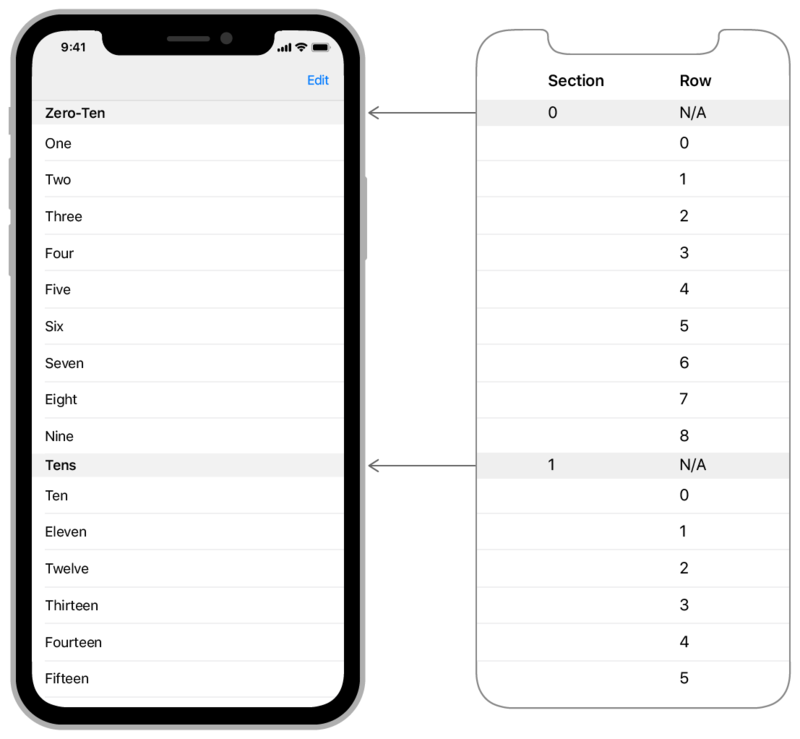 For example, you must implement the tableView(_:commit:forRowAt:) method to enable the swipe-to-delete feature for rows. For information about how to create and configure your table's cells using your data source object, see Filling a Table with Data. Table views communicate the location of cells to you using the row and section properties of NSIndexPath objects. Row and section indexes are zero based, so the first section is at index 0, the second at index 1, and so on. Similarly, the first row of each section is at index 0, which means you need both the section and row values to identify a row uniquely. If your table has no sections, you need only the row value. Tells the data source to return the number of rows in a given section of a table view. Asks the data source to return the number of sections in the table view. func tableView(UITableView, titleForHeaderInSection: Int) -> String? Asks the data source for the title of the header of the specified section of the table view. func tableView(UITableView, titleForFooterInSection: Int) -> String? Asks the data source for the title of the footer of the specified section of the table view. Asks the data source to commit the insertion or deletion of a specified row in the receiver. Asks the data source to verify that the given row is editable. Asks the data source whether a given row can be moved to another location in the table view. Tells the data source to move a row at a specific location in the table view to another location. func sectionIndexTitles(for: UITableView) -> [String]? Asks the data source to return the titles for the sections of a table view. Asks the data source to return the index of the section having the given title and section title index.